England 2-0 Lithuania: What now for Gareth Southgate's team? Gareth Southgate will feel a sense of cautious optimism after his first two matches as permanent England manager in succession to Sam Allardyce - but some familiar questions remain. 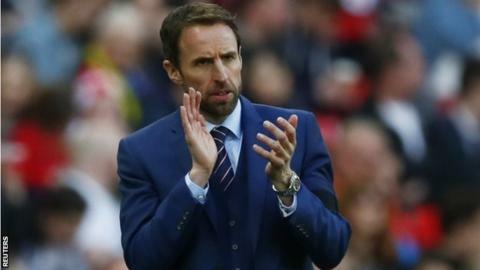 Southgate was delighted with aspects of England's display in defeat in the friendly against Germany in Dortmund on Wednesday while the unspectacular win against Lithuania was all about getting three more points towards World Cup qualification. So what will Southgate take away from the last week as England look ahead to their next qualifier in Scotland on 10 June? Can you name England's oldest goalscorers? Southgate set the normal rules about strikers and age aside to bring 34-year-old Jermain Defoe back into the England fold four years after his last goal for his country, scored in a victory against San Marino. Injuries to main striker Harry Kane and all-time record goalscorer Wayne Rooney forced Southgate's hand but he was able to call on the hard evidence provided by Defoe's 14 Premier League goals in a Sunderland side renowned for not making chances and rooted to the bottom of the table. Defoe has always traded in the game's most important currency, goals, throughout his lengthy career. This was a performance designed to demonstrate to doubters and Southgate he has not outlived his usefulness at international level. He was sharp and saw one chance saved before he demonstrated his poacher's instinct in the penalty area to slide in Adam Lallana's pass in the 21st minute before flashing another shot narrowly off target. In many respects he is an old-fashioned attacking operator in that his first thought is always the back of the net and shooting at it. No extra touches or passes are required. Defoe had two shots on target, one off target and one blocked with very limited opportunities - but most significantly made England's breakthrough. He is selfish in just the right way and in a World Cup qualifying group where England will be confronted by the sort of mass defence Lithuania presented here, it is unlikely this will be a temporary return to the colours. Dele Alli was given heavy-handed - or more precisely heavy-footed - treatment from Lithuania as they tried to light the short fuse that has brought Tottenham's 20-year-old some unsavoury headlines in his short career. It meant Alli was nowhere near as influential as he was in Dortmund on Wednesday, where his efforts will have imprinted his importance for both the present and the future in Southgate's mind. With Alli subdued, this was the chance for Liverpool's Adam Lallana to step forward and confirm his progression into a fully-fledged first-choice member of this England side. The 28-year-old is a late developer for England but his rejuvenation under Jurgen Klopp at Liverpool is now reaping dividends for Southgate as a very important spin-off. Lallana has been directly involved in four goals in his last five England appearances, three goals and one assist, and was unlucky to strike the post in Germany. He combined natural energy and creation with subtlety at Wembley, the qualities needed to make a difference in an attacking framework with England - with his beautiful, imaginative touch inside a crowded penalty the perfect invitation for Jamie Vardy to make the game safe against Lithuania. If his Liverpool captain Jordan Henderson and Tottenham's Eric Dier can provide a solid midfield shield for England's defence and freedom for those further forward, Southgate will hope Alli and Lallana will flourish even more on the road to Russia. Jermain Defoe showed exactly what a natural goalscorer can bring to England - which is why Southgate will want Tottenham's Harry Kane restored to full fitness as soon as possible. England have players who can score goals, as Vardy also proved, with Wayne Rooney not willing to take a back seat yet and youngsters such as Marcus Rashford ready to stake their claim. But Kane, still only 23 and with 19 goals and four assists for Spurs in the Premier League this season, is the class act Southgate will want fully recovered from his ankle injury to spearhead England through the rest of the campaign. Kane, and he was not alone here, endured a miserable Euro 2016 perhaps memorable only for then manager Roy Hodgson's puzzling decision to put a proven goalscorer (and a tall proven goalscorer at that) on corner-taking duty. He has endured a dry spell with England, with five goals in 17 appearances, but his performances at club level this season have shown further maturity and he has the sort of mature and measured personality that could yet mark him out as a future England captain. Kane is currently recovering from ankle ligament damage and is weeks away from full fitness - but in the long-term he will be a centrepiece of Southgate's plans as the man to take the opportunities England missed in Germany and against Lithuania. Burnley's Michael Keane has been the beneficiary of Gareth Southgate's willingness to move outside the Premier League elite with his selection policy and the opportunities that can suddenly present themselves at international level. Keane moved up the England pecking order when Phil Jones hurt his toe in collision with Manchester United team-mate Chris Smalling and had to withdraw from the squad before the Germany game - and got another chance following his fine debut with Gary Cahill suspended and Smalling an injury casualty for the Lithuania qualifer. The 24-year-old slotted in perfectly to a three-man defence alongside Smalling and Cahill in Germany and was an able partner to John Stones against Lithuania, although the lack of serious attacking threat from England's opposition in Sunday's game must be used as context. Keane has, however, given the impressive initial impression that he has the composure and concentration for international football and has been one of the major positives for Southgate and England this week. Once again England's route to a major tournament does not seem to have an obstacle in sight - a familiar journey to what might prove to be a dangerous final destination. England and Southgate have no excuses for failing to progress to Russia from a group containing Slovakia, Slovenia, Scotland, Lithuania and Malta and all the evidence suggests it will be as straightforward as expected. It was the same under former manager Roy Hodgson and England's untroubled qualifying campaign for Euro 2016, which brought an unblemished 10 wins out of 10 against Switzerland, Slovenia, Estonia, Lithuania and San Marino. England set off for France with optimism but only recorded one win against Wales before the embarrassing exit against Iceland in the last 16. The conundrum for Southgate is that the true measure of England's progress and test of how far they have come under his tutelage may only be revealed when they are faced with a higher-class of opposition in a competitive environment. One of Southgate's major tasks between now and what looks like certain qualification for the 2018 World Cup in Russia is to find a way of discovering just how good this England team is - and how to uncover any flaws before the serious business begins.